Last few weeks I have had the opportunity to attend many events where brands showcase their products. I love attending these homeware shows as you get a chance to see new products that are being launched on the market, together with some old time classics. I am sharing below a round up of some really lovely samples, I have had the privilege to test out and use in the simplyfood kitchens. 1. Gourmet Gadgetry Vintage Tea Party Mini Toasted Sandwich Maker has non-stick baking plates to make 8 cute little toasted sandwiches ideal for a tea party. 2. Tala Salt and Pepper Mills are adorable novelty mills that are perfect for the dinner table. 3. Tower Veggie Peeler and Brush is very convenient as it is placed on your finger whilst peeling vegetables. The accompanied brush is handy for cleaning vegetables and fruit. 4. T and G Crush Grind Spice Mill crushes and grinds all types of spices and herbs. It has an adjustable setting for coarse and fine. 5. Addis Pop and Store is a collapsible container that can be used to keep your food fresh. 6. Sparq Home Hammered finish Copper Mule Mug is a really lovely size for serving chilled drinks in a stylish way. 7. Sistema Bento Lunch Box comes complete with compartments, food tray and a yogurt pot makes taking packed lunches very convenient keeping various foods separated. 8. JWP Good 2 Go Portion Perfect is a storage container collapses down for easy storage and helps to maintain healthy portion sizes for a balanced diet. 9. Mason Cash Wooden Spoon is a 3 in 1 utensil which stirs and blends, measures and scrapes. 10. Victorinox swiss made handheld grater with a curved silicone handle and safety cover to protect the blades. 11. Viners spoon, fork and knife set. 12. Kitchen Aid Silicone Spatula is perfect for all baking tasks. 13. Bobble make water better filter bottle is a reusable bottle that filters water as you drink. This is perfect for on the go in the car to work or at the gym. 14. Zoku Shooter Ice Moulds create edible ice glasses perfect for serving desserts or cold shots. 15. Jersey Pottery sardine run designed Jug is a cute little jug for milk or cream and would look perfect on any table. 16. Aladdin Bistro To-Go Hybrid Bottle keeps drinks cool for 12+ hours and ice for 16+ hours which is perfect for picnics. 17. Kilner Jar is a perfect little glass jar that is ideal for serving mini drinks. 18. Kuhn Rikon Scourer is a stay clean silicone scrubber that is hygienic and dishwasher safe. 19. Any Sharp is a kitchen knife sharpener with a powerful suction grip securing the sharpener to the table or flat surface and is good for straight or serrated blades. I am totally thrilled with all these new items. They are going to be very useful in and around my home, especially the storage and cooking utensils which you can never have too many off. I would like to thank all the brands that are featured in this post who have gifted me these wonderful products to try. Oh I love the salt and pepper mills, as well as that copper jug - it's beautiful! Yes they are really nice . What a fab collection of homewares!! I love the look of the filter bottle, I really need one so that I can drink more water, I'm useless at remembering! awesome collection of Kitchen appliances, Fantastic list :) Thanks for sharing! The tea sandwich maker would be so useful for me! With 2 toddlers, I'm always looking for new meal ideas, and I really think tea sandwiches would be the perfect size for tiny hands. Thanks so much for sharing. 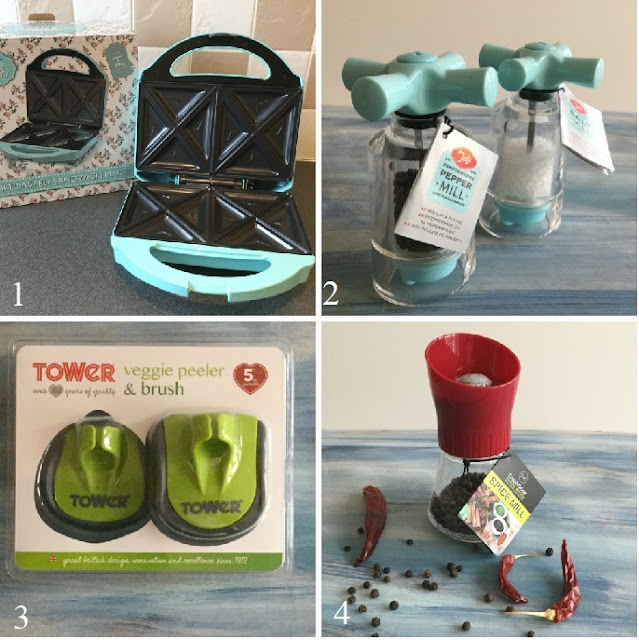 Wow, I'd love to have the mini sandwich maker, the portion perfect containers, those cute pepper mills and the silicone scrubber (that looks super handy!) You are really lucky to have these wonderful additions to your kitchen. What a great range of products that we could all really use from time to time. The knife sharpener in particular really caught my eye to replace my current one. All these kitchen products looks classy and useful. I loved that copper Mule listed in 6th place the most. Thanks for sharing. Great kitchen gadgets here. My two favourites are the toasted sandwich maker and the collapsible container. What a great idea to save space when you are not using the container. I'm fed up with all mine falling out of the cupboard when not in use. Of all of those I really love the salt and pepper grinders the most. I love the taste of freshly ground salt and pepper on my foods and not stuff sitting around forever. Oh these products are really great. I always wanted to have sandwich maker. I always love the look of the copper Mule mugs but I've yet to try a mule!! I love the Ayurvedic health benefits of copper too, it sterilizes the water (I have a copper water bottle at home) they drink out of copper vessels when the water isn't as clean because of the antibacterial properties in copper. I always love trying new kitchen gadgets and I especially love the cute little mini toasted sandwich maker. That would really come in handy for me. Awesome products! 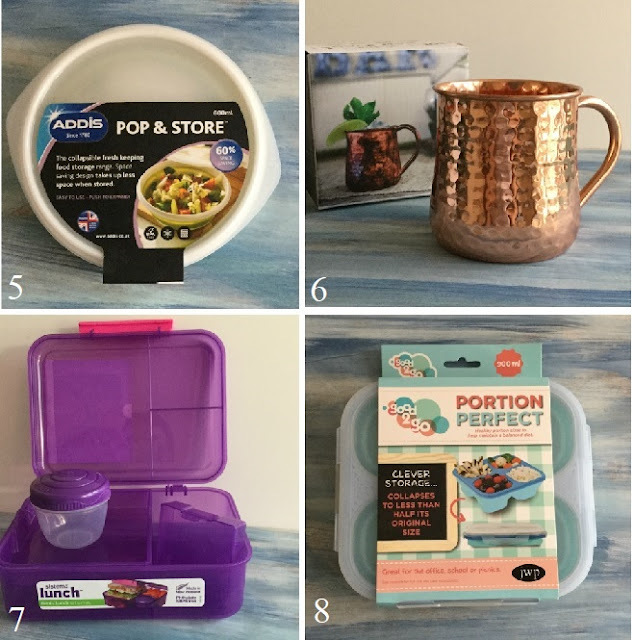 If I were to pick the ones I like most, it would be the Zoku Shooter Ice Moulds and the Aladdin Bistro To-Go Hybrid Bottle. The copper mule mug would be a nice gift for a friend who loves creating her own original cocktail drinks. Love trying new kitchen gadgets, thanks for sharing. Some lovely items there. I particularly like the top on the pepper mill. These items look great. I especially like the Sardine Run jug and the knife sharpener. Lobster Apron Review and Giveaway.